St Joseph’s Church is located in Wheaton, Illinois, the capital of DuPage County, approximately 30 miles west of the Chicago loop. Travel west on Roosevelt Road to Washington Street [look for sign saying “Orthodox Church” at intersections]. Turn right on Washington Street to Crescent Street [look for second sign]. Turn right on Crescent Street. Church is on the right. 10:00 AM Divine Liturgy, Pot Luck Luncheon. 9:30 AM Liturgy of the Presanctified Gifts. 7:30 PM Liturgy of the Presanctified Gifts, Lenten pot-luck. Please call the Rectory at 708-519-0663 for schedule of other services or to arrange Baptisms, Marriages, Memorials, Thanksgiving Services, etc. In November 1983, several individuals visited the home of Fr John and Barbara Matusiak and expressed the desire to plant a pan-Orthodox mission community in DuPage County, a rapidly growing area west of Chicago. Since Fr Matusiak had been appointed by Bishop Boris of Chicago to establish a similar mission community dedicated to St Luke the Evangelist in the southwest Chicago suburbs some 30 miles away, it was proposed that the DuPage faithful attend St Luke’s until there was a large enough group to form a second mission, hopefully within five years. By 1988, there were sufficient numbers of committed and potential families to warrant development of a serious plan to plant a new mission in DuPage County. A demographic study was conducted, and Naperville, DuPage Country’s fast growing community, was selected as the mission station’s site. With the blessing of His Beatitude, Metropolitan Theodosius, Primate of the Orthodox Church in America, Fr Matusiak celebrated the mission station’s first Divine Liturgy in March 1989 with thirty-four adults and children. Until the beginning of the mission’s second year, services and meetings were held at SS Peter and Paul Convent chapel in Naperville. The community soon outgrew the tiny chapel and, in 1990, Sunday gatherings were relocated to Naperville’s Brookdale School. Lenten and other services were celebrated in the faithful’s homes. With the mission growing as rapidly as DuPage County itself—by the end of 1993 the community counter over 150 children and adults—the search for property began. On Holy Thursday, 1994, negotiations to purchase the DuPage A.M.E. Church in neighboring Wheaton were concluded. The first service at the new location, Matins of Great and Holy Friday, was celebrated four hours later! In June 1994, His Grace Bishop Job of Chicago proclaimed St Joseph’s a full parish of the Orthodox Church in America. By the end of the same year, the parish had grown substantially, and the need for a larger facility became obvious as the church building could no longer accomodate the entire congregation. A variety of options were considered and, and on the first Sunday of October 1995, the faithful voted to pursue the erection of a new church on the lot next to the present church which is currently occupied by a parish-owned house used for Sunday School classes. Designs for a traditional Orthodox Christian temple to accomodate 300-400 were drawn up, and the parish looks forward to erecting the new church in 1996. Today, St Joseph’s is the spiritual home of over 300 children and adults. Nearly 80 percent of the faithful are under the age of 40. Most of the faithful hail from other areas of the country, and prospects for continued growth are excellent as newcomers continue to more into DuPage County. The full cycle of liturgical worship in the English language, congregational singing, innovative Church School and youth programs, adult discussions, the “Journey to Orthodoxy” group for those interested in entering the Orthodox Church, and an emphasis on outreach, fellowship, and stewardship have served to attract many, Orthodox and non-Orthodox alike, to St Joseph’s. The community’s large number of teens actively participate in the parish’s “Junior Joes” O Club and frequent retreats, lock-ins, and camping programs. In January 1996, an outreach/fellowship/mission group for adults, the “Senior Joes” O Club, was established. St Joseph’s is a parish member of the Fellowship of Orthodox Stewards and hosts a FOS weekend every November. The faithful also participate in a variety of international Orthodox programs and youth camps and maintains sister parishes and youth groups in Belarus, Poland, Holland, and Russia. 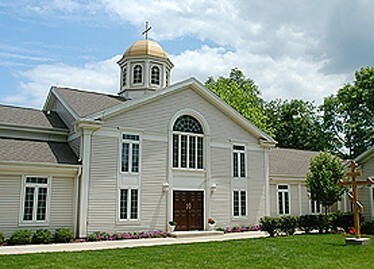 The parish’s location across from Wheaton College and the Billy Graham Center offers a unique opportunity for additional witness to Orthodox Christianity.